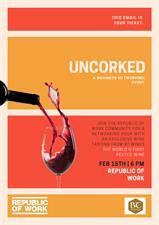 Join the REPUBLIC OF WORK community for a networking hour with an exclusive wine tasting from BT Wines. To kick off the weekend in style we are invite all Cork Chamber members to an evening networking hour in the REPUBLIC OF WORK Business Lounge - A great opportunity to catch up with fellow members and make new contacts! On the evening we will be joined by BT Wines, Ireland's first peated wine, who will be giving an exclusive tasting of their Irish Peated Pinot Blanc and Irish Peated Pinot Noir.